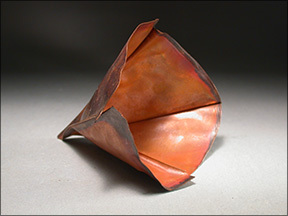 Fold a square of annealed 24 gauge metal corner to corner to make a triangular shape. 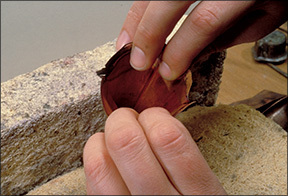 Flatten the folded edge with a mallet, taking care to line up the edges neatly. Fold the triangle in half again in the middle, which will make a smaller triangle. Mallet this flat. Make sure that the folded package will fit into your rolling mill. 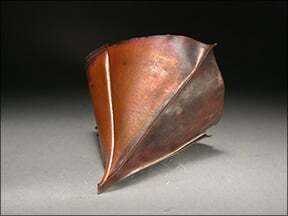 The long side has no folds-it shows only sheet metal edges. 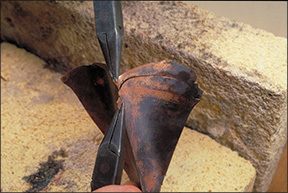 One of the shorter sides has one thick folded edge and the other has two thinner folded edges. 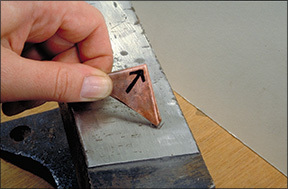 The closed point-where the two short sides meet-is the part that enters the mill first (as indicated by the arrow). Open the rollers wide enough to slide the folded metal through, then tighten them down onto the stack. 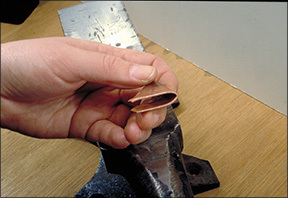 This provides a starting point for rolling to begin (shown in photo). 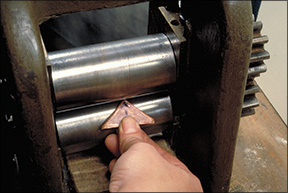 Tighten the mill and roll the stack through under light pressure, always starting with the same closed point of the triangle. Tighten again and make another pass. Generally I find that an eighth of a turn on the sizing handle is a suitable amount between passes. 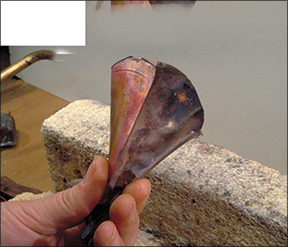 Roll the cup until the length is about two to three times the original size. When the rolling is complete, anneal thoroughly and quench. Unfold the metal gently. Sometimes a slight tug with chain-nosed pliers is needed, but take care to avoid marking the metal. Once the cup begins to open, use only your fingers to carefully open it, avoiding kinks and dents. 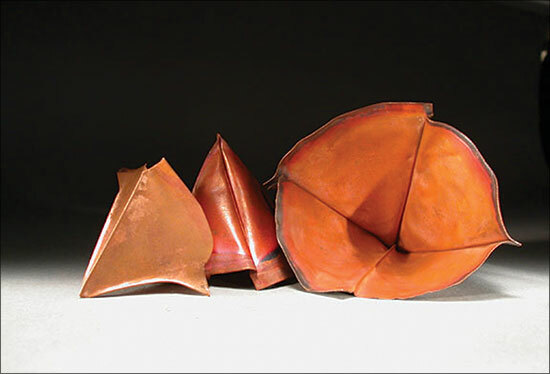 Here are three views of finished cups. 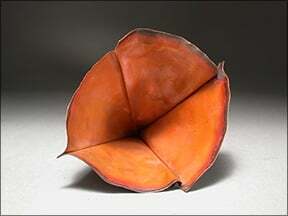 The colors give an indication of where the tightness of the folds limited the access of oxygen. The black areas near the rim received the most oxygen, while the red areas received less. The inside of the cup is bright and clean because there was no oxygen present to react with the copper.